This Friday, October 3rd, MACRoCK will be kicking off MACROCKTOBER with the Pop-In Art Show at the Orange Chair Collective. The exhibit, which will last one day only, is a fundraiser for the MACRoCK festival, and features local artists (and WXJM members) and local bands Zooanzoo and Grooveyard. 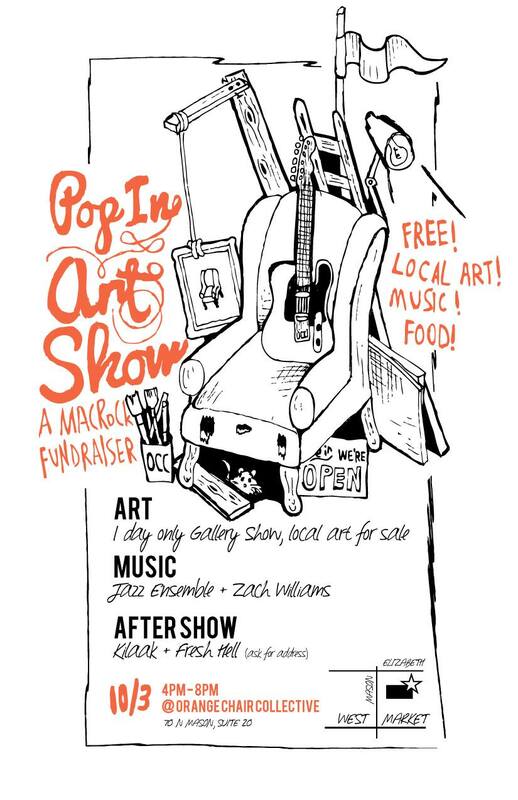 The Pop In Art Exhibit is a collaborative effort put on by MACRoCK Committee, Orange Chair Collective, and other artists for the purpose of showcasing different mediums of art in an alternative space. The goal of this pop-up art experience is to create a temporary gallery space to display art and culture in an nontraditional way, and to sustain MACRoCK as an enduring organization and cultural institution of and for the local Harrisonburg community. The Art Show coincides with First Friday's Downtown: Harrisonburg art crawl tour, created and run by the Arts Council of the Valley.